Wahama senior Lexi Layne bumps a ball in the air during Tuesday night’s TVC Hocking volleyball match against Southern at Gary Clark Court in Mason, W.Va.
MASON, W.Va. — From winless to a winning streak. It’s been a pretty good 24-hour cycle for the Southern volleyball team as the Lady Tornadoes picked up their second straight victory on Tuesday night following an 18-25, 25-21, 25-16, 25-19 decision over host Wahama in a Tri-Valley Conference Hocking Division contest at Gary Clark Court in Mason County. 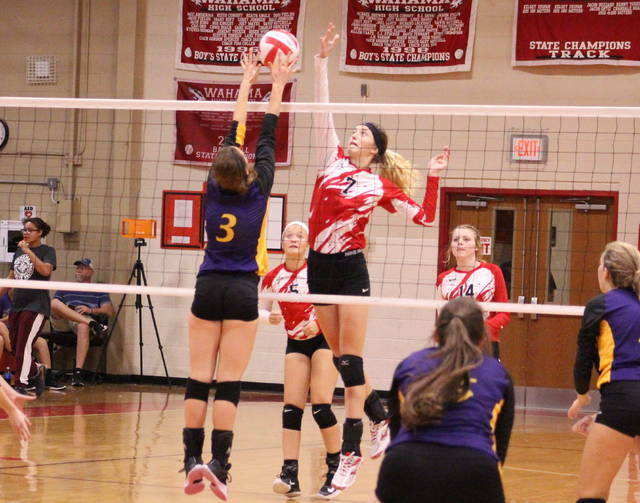 The Lady Tornadoes (2-9, 2-6 TVC Hocking) never led in the opening bout, but the guests trailed by a single point only twice over the course of the next three games — ultimately allowing the Purple and Gold to roll to a 3-1 match triumph. The Lady Falcons (1-6, 1-6), conversely, held leads of 6-5 in Game 2 and 8-7 in Game 4, but the Red and White were never closer than 16-all and 8-all in those respective contests. The hosts also trailed 11-0 at the start of Game 3 before falling by a nine-point margin. WHS led wire-to-wire and had nine of its 17 kills in the opening game, which included a lead as large as seven points on four different occasions. SHS, however, built a 5-0 lead in Game 2 — only to see the hosts rally back with six straight points for their only lead. Facing a 20-19 score, the Lady Tornadoes reeled off four straight points and eventually closed things out for a four-point win. Sydney Adams produced 11 consecutive service points at the start of Game 3 — and the guests led by as many as 13 points (19-6) — before cruising to a 2-1 match advantage with the nine-point win. Wahama rallied back from an early 6-1 deficit to take its final lead of the night at 8-7, but Southern responded with 13 of the next 19 points for a 20-14 edge. WHS closed to within 22-19 before surrendering the final three points of the match. Adams led the SHS service attack with 22 points and six aces, followed by Baylee Grueser with 13 points and Peyton Anderson with nine points. Kassie Barton and Phoenix Cleland also contributed eight and five points, respectively. Baylee Wolfe was next with three points and Marissa Brooker had one service point as well. Barton also had three aces for the guests. Wolfe led the net attack with 14 kills and five blocks, followed by Cleland and Jordan Hardwick with four kills apiece. Mickenzie Ferrell and Saelym Larsen each chipped in two kills. Cleland and Ferrell also had a block apiece. Harley Roush and Tori VanMatre paced the Wahama service attack with 13 points each, followed by Emma Gibbs with nine points. Gracie VanMeter and Hannah Billups were next with six points apiece, with Logan Eades also adding two points. Gibbs led WHS with five kills and seven blocks, with Billups and Eades each chipping in four kills. Eades also recorded four blocks in the setback. 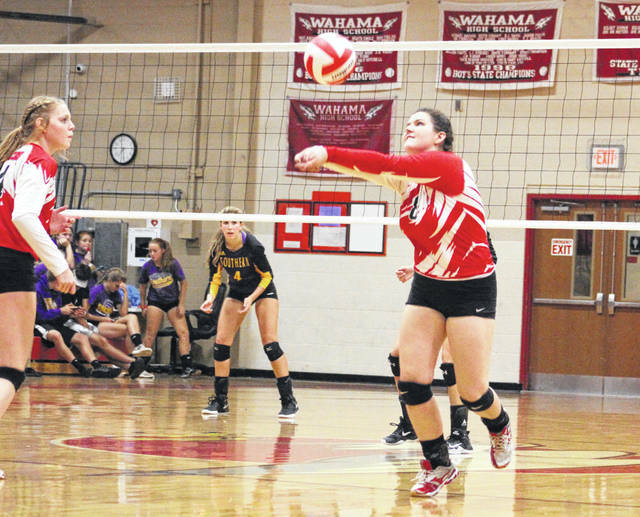 Wahama returns to action Thursday as it travels to Corning for a TVC Hocking match with Miller. The Lady Tornadoes also head to Miller on Monday for their next contest.